Sep. 2, 2016 6:00 a.m.
And the host team emerged as the winner of the community-run Olympic Games for seniors in Langley’s Campbell Valley Park. The Tuesday afternoon (Aug. 30) event saw teams of competitors vying for bragging rights in four events, the seated horseshoe toss, seated basketball, putting, and the toilet paper toss, where the object is to put a roll through a toilet seat target. The Langley Lodge, the hosts, took first place and gold, followed by the White Rock Seniors Village (silver), Surrey’s Westminster House (bronze) and Crescent Gardens in Surrey (special fourth place trophy in green). While the events are whimsical, they have a serious purpose behind them, which is encouraging seniors to be physically active, said Charlene Koop|, Langley Lodge Recreational Coordinator. “We (Langley Lodge) won because we trained the most,” Koopl said. Brothers Allan Brown, 84, and Tom, 93, both residents of the Langley City lodge, brought a little sibling rivalry to the event. Because they were on the same team and individual scores are not recorded, there was no direct competition, but the younger Brown said he thought his big brother did slightly better. “I missed a few,” Allan said. “Everyone did their best,” he said. About 50 competitors took part. 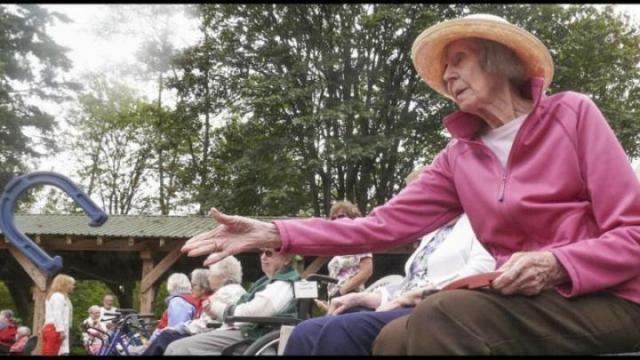 The one-day Olympics event for senior care homes throughout the Fraser Valley has been held every four years since 2004.